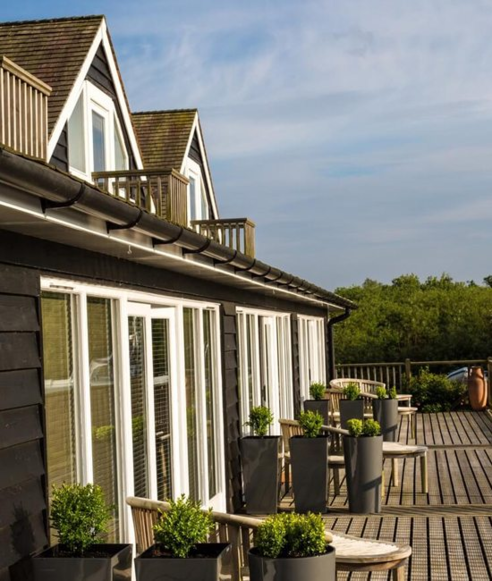 Set on the River Yare, just south-east of Norwich, Yare View Holiday Cottages are ideally placed to discover the beautiful Norfolk Broads and to visit the historical City of Norwich and surrounding areas. With many great gastro-pubs and restaurants, exciting activities for kids and several popular beaches all within 30 minutes of the cottages, you be sure to find plenty to do. Conveniently located a short, 3 minute walk from the cottages, Brundall Gardens Train Station provides a great way to get around. With regular trains, Norwich is only one stop away and the coast just 25 minutes in the other direction. Yare View Holiday Cottages offer 5, high quality accommodations for 2-6 people, each with their own private hot tub, and great views of the river, especially at sunrise and sunset. Whether you’ve come to relax and unwind, intend to explore Norfolk or sample Norwich’s vibrant night-life, Yare View Holiday Cottages are the perfect destination.